Home of The 1 Voice Offering custom audio to sell your product or service. Home of the 1 voice is here. The 1 Voice that was created in Cleveland,OH, during the early ’50’s. Got hooked on Radio back in the mid ’60’s. Listening to local Cleveland, OH Radio stations like legendary WKYC Radio 11, WHK 1420, PLUS WIXY 1260 among others. Yes, Clevelanders also listened to THE BIG 8, CKLW (AM 800) from Windsor, Ontario, Canada. I thought, ‘Hey, this sounds like FUN. I’d love to do that’. Playing records, putting listeners on air, giving away prizes. Why? Because I was making them happy. Having fun & getting paid too! The 1 Voice hung out with many incredible, super talented DJ’s. Even answered Big Jack’s (aka Jack Armstrong) request line phones Saturday nights. At that time, Radio 11 WKYC was one of only NBC’s O&O (owned and operated Radio stations). After that experience, decided I HAD to get into and on the Radio. I was a betting man and successfully wormed my way in. Officially debuted on commercial FM Radio after midnight, June 1, 1970. WXEN-FM, 106.5. I was a Junior at the time at St Joseph’s High School, Cleveland, OH at the time. The 1 Voice has been on an exhilarating, beyond belief ride that hasn’t stopped. I STILL LOVE IT! What has the 1 voice been doing in Savannah, GA, since ’81? What a historic town and great place to live. 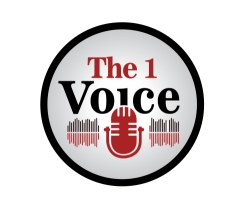 The 1 Voice is a professional On Air Radio personality with over 40 + years Radio experience. Really love interactions at WRHQ-FM live remote promotions. Winner drawing. Live location events. The results! Not to mention talking, entertaining, creating serious, straight forward messages. Did I mention my off-the-wall ‘gotcha’ attention getting commercial messages? I’m the 1 voice you need to capture the ears of potential customers no matter what. Radio & TV commercial audio, YouTube intros, cold voice reads and whiteboard videos. Did I mention Voice Mail greetings plus business PBX or automated voice attendant direction prompts? I’ll do it now. If you can think of it, need or want it, THE 1 VOICE can deliver. Hear some samples now.